The Grove development will be voted on at the Sept 22 city council meeting. Let the city council know if you’d like to support adding more housing in central Austin to help with Austin’s severe housing shortage to help address affordability issues for homeowners and renters. The Grove is located near the intersection of 45th Street and Bull Creek in central Austin. 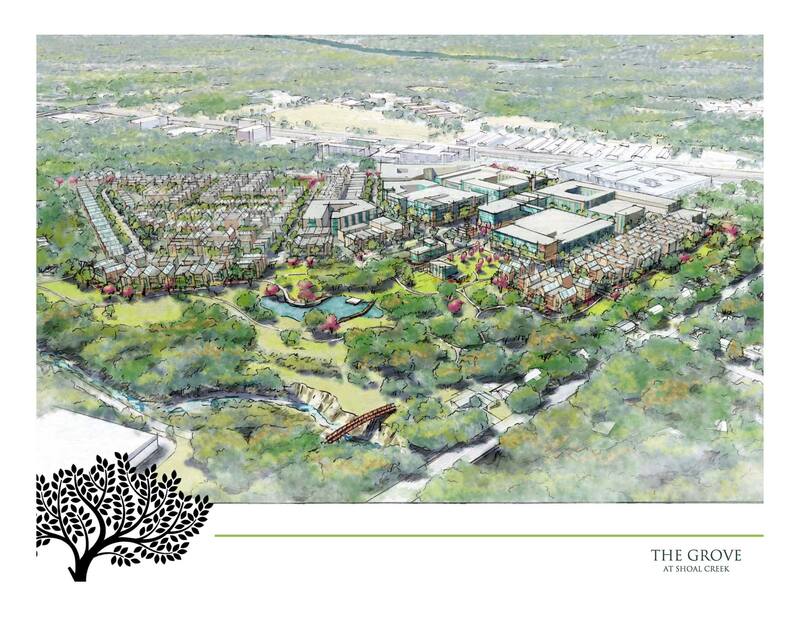 The Grove will include new local nearby businesses, restaurants, and shops, 18+ acres of new parkland, 2 miles in new trails, traffic improvements for 45th St, and around 100 affordable housing units, including affordable housing set aside for AISD teachers. Friends of Austin Neighborhoods members voted to support “granting zoning and entitlements at the Grove at Shoal Creek necessary to create a dense, walkable, mixed-use community with an abundance of housing and jobs, and a diversity of housing types and sizes.” To view the full text of the membership vote, please visit http://www.atxfriends.org/votes/. Every email matters! Take 5 seconds and be heard! (1) Enter name and email. (2) Click “send” and an email is sent to the Austin City Council! I support granting zoning and entitlements at the Grove at Shoal Creek necessary to create a dense, walkable, mixed-use community with an abundance of housing and jobs, and a diversity of housing types and sizes. Due to our severe housing crunch and the known environmental benefits of compact, mixed-use development, it is important to approve new much needed housing in our urban core. Thank you for your time, and please consider voting for the Grove. Become a member of Friends of Austin Neighborhoods (FAN) now! Our communities need a neighborhoods-based voice that is inclusive, innovative, and supportive of neighborhood improvement rather than the unsustainable status quo. Every member that signs up helps our cause! When there are votes on issues that impact Austin like the one on the Grove, you get to weigh in by voting online along with all of our other members. Signing up is free and just takes a few seconds by clicking the button below.